So you’ve found a home and made an offer, congratulations! Now it’s time for a home inspection — here’s what to expect in a home inspection. Let’s start with some basics. A home inspection is a visual inspection of a home — this means what is observable without moving, dismantling, or deconstructing systems in the home. Your home inspector should visually inspect and evaluate all systems of the home, from the roof and attic, to the exterior, interior, and crawlspace. They’ll test lights, windows, doors, and plumbing fixtures. They should also give you some basic information about the home, such as where to access emergency shut-off switches and valves for power and water. This typically takes between two and three hours depending on the size and age of the home. You should expect your home inspection to help you discover any issues, concerns, or deficiencies and limit the chance of any unpleasant surprises before the title is in your name. It’s possible a few big repairs may be needed. Your real estate agent should be able to guide you through this process. They know the market and can help you set realistic goals and expectations. By the end of your home inspection, you should know the condition of the home and be confident to make negotiating decisions. Always ask questions and let your home inspector know of areas you are particularly concerned about. That said, if you have a question that can wait until the end, ask it then. It’ll reduce the inspection time and help your inspector stay on task. At the end, your inspector should give you a summary of the home inspection and highlight the most important items. If you have questions on any of the items they’ve brought up, have them show you what they’re talking about and ask follow-up questions if something doesn’t make sense. Improperly installed, damaged, or missing flashings. Significant amount of water in the crawlspace. Your Northbank Home Inspection report will be chock-full of information, pictures, and sometimes videos. It can be overwhelming. But, many of the items in an inspection report are common issues found on most homes and are there to help give you information you can use for budgeting future maintenance, pre-sale repairs, or for sale negotiations. I’ll be sure to make clear which items need immediate attention or are most concerning in the report and in the post-inspection verbal overview. Also included in every Northbank Home Inspection report are informational items about systems and appliances in the home. This provides you with important information like serial numbers, brands, and ages of appliances, which can help you with servicing, replacement parts, and budgeting for replacements in the future. The report will also have fairly formal language – designed that way so you and your agent can easily build a repair request document from the report. If you attend or are available to talk after the home inspection, I’ll be sure to touch on any significant issues discovered during the inspection. I’m always available to talk, text, or email — I respond quickly — if you have any questions at all once you’ve had a chance to sit down and go over the report. In addition to a home inspection, consider a radon test — especially if you live in Clark County or Skamania County where at least one in four homes have elevated radon levels. Read more about radon and its dangers on our radon testing page. Additionally, Northbank Home Inspection also offers mold testing, asbestos testing, and water testing. We can also schedule a sewer scope for you with a reputable and knowledgeable plumbing company in the area — just let us know when scheduling your inspection. Ready to schedule a home inspection? 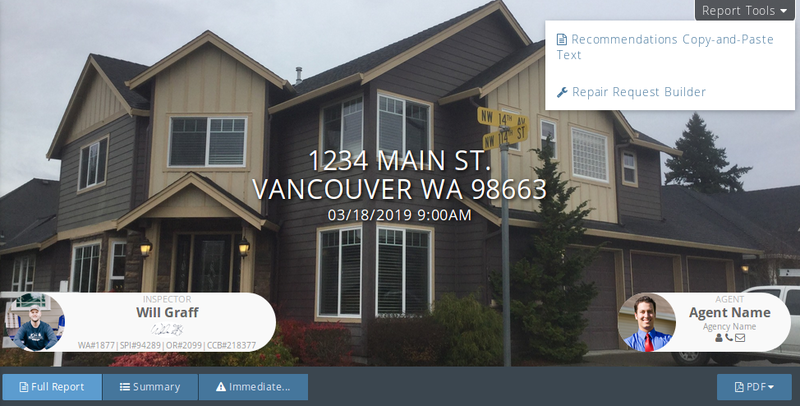 Washington state’s home inspector standards of practice are a baseline for what you should expect in a home inspection. Northbank Home Inspection’s standards exceed the state’s requirements — every Northbank Home inspection includes thermal imaging and pest and dry rot inspection (WDO inspection). Thermal imaging helps identify energy efficiency trouble spots and hidden leaks that could be missed without the technology. Thermal imaging can help identify roof leaks, plumbing leaks, appliance failures, missing insulation, energy loss, and much more. It’s a tool we use to assist our visual inspection to give you additional information in our reports. Also included in every Northbank home inspection is a pest and dry rot inspection, also known as a structural pest inspection. As a licensed Washington State Department of Agriculture Structural Pest Inspector, I inspect for wood-destroying organisms (WDO) and conducive conditions that could help them thrive at every home inspection. This is an additional license that requires special knowledge of WDOs. This license is not required by the state, but make sure your home inspector has a structural pest inspection license and includes pest and dry rot observations in their home inspection report. Unlike municipal building inspectors who sign off on permits, home inspectors are not code inspectors. That said, a home inspection is typically much more thorough and involved. That’s why even if a home has permits, it doesn’t necessarily mean the contractors completed the work properly, although it makes it much more likely. A quality home inspector will call out items that do not meet modern safety codes, which provide a baseline for safety standards. And while these are important, often times older homes do not meet modern building or code standards. Most of the time, this is not something that should be of immediate concern, but something to consider budgeting for in the future. When this comes up in your home inspection report, be sure to ask your home inspector about it and have them explain the issue. As a home inspector, I have your best interests in mind and may include items within the home inspection report that go beyond basic safety codes to help you make informed, safe decisions about a home.